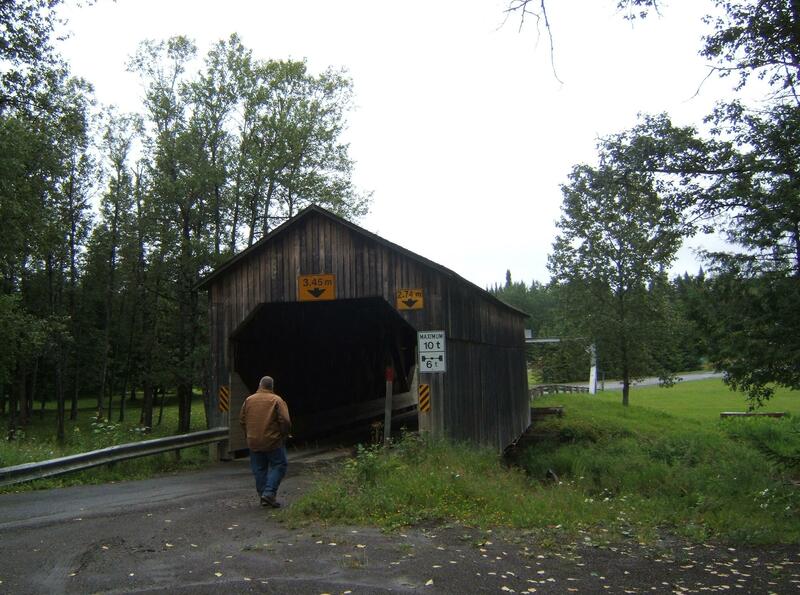 Why are covered bridges covered? 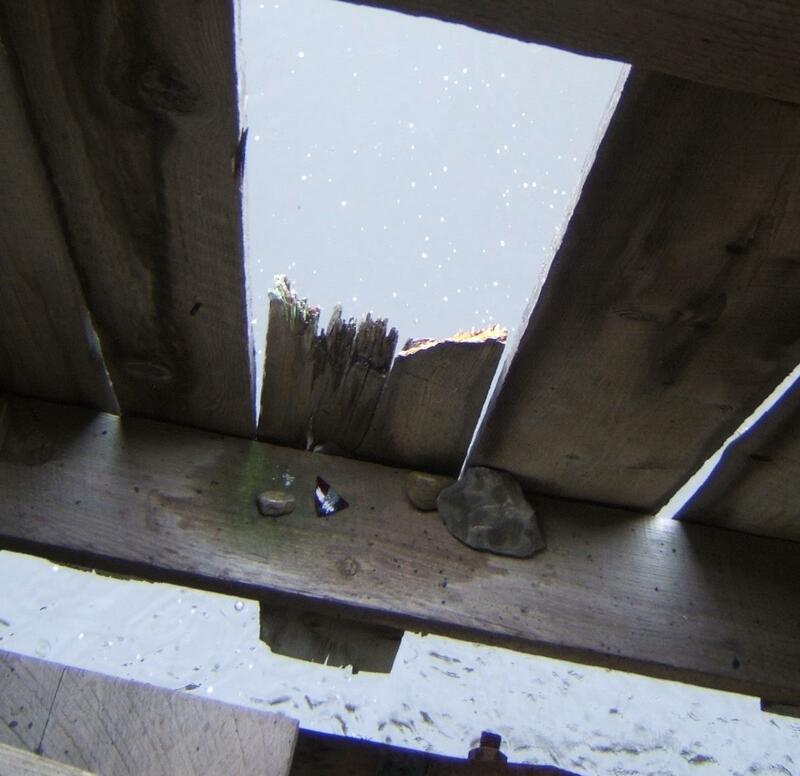 The usual explanation says that a covered bridge lasts longer if the wood is protected from the elements. 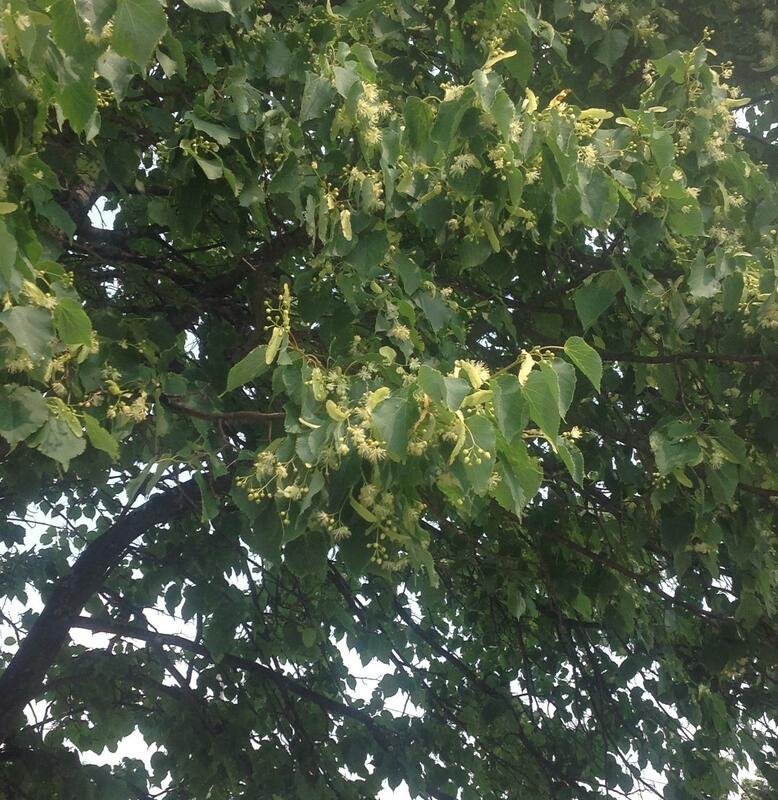 However there are other explanations. One of these claims the covering of the bridge made it easier to coax horses to cross the river. 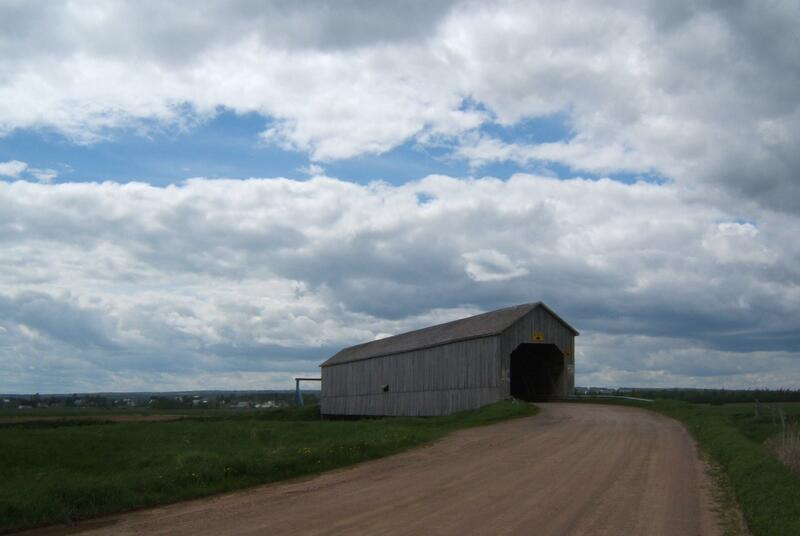 The horses, accustomed to entering and leaving a barn, would be less alarmed if a bridge was covered. 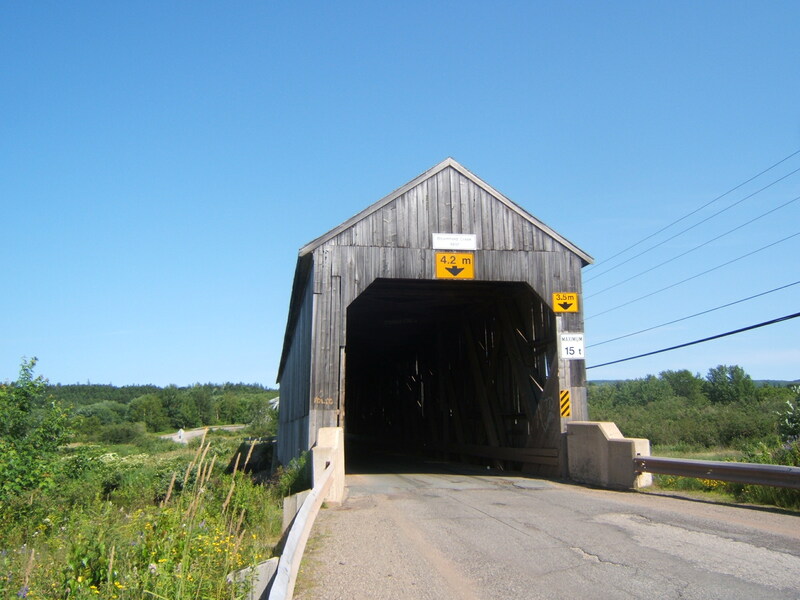 In the early 1900s, when most of the remaining covered bridges in New Brunswick were built, horses were still a common means of conveyance. 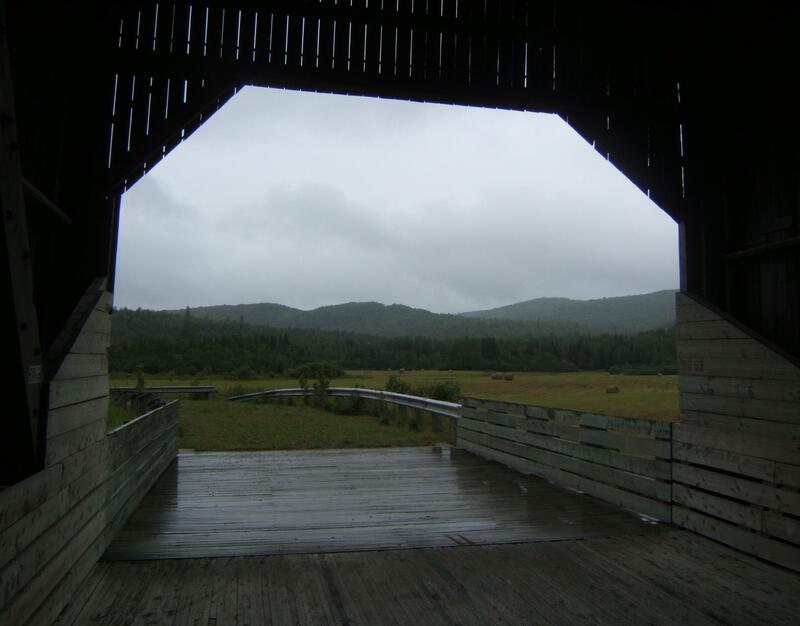 In my travels to study the plants and animals associated with covered bridges, I have come across three instances of the association between covered bridges and horses. 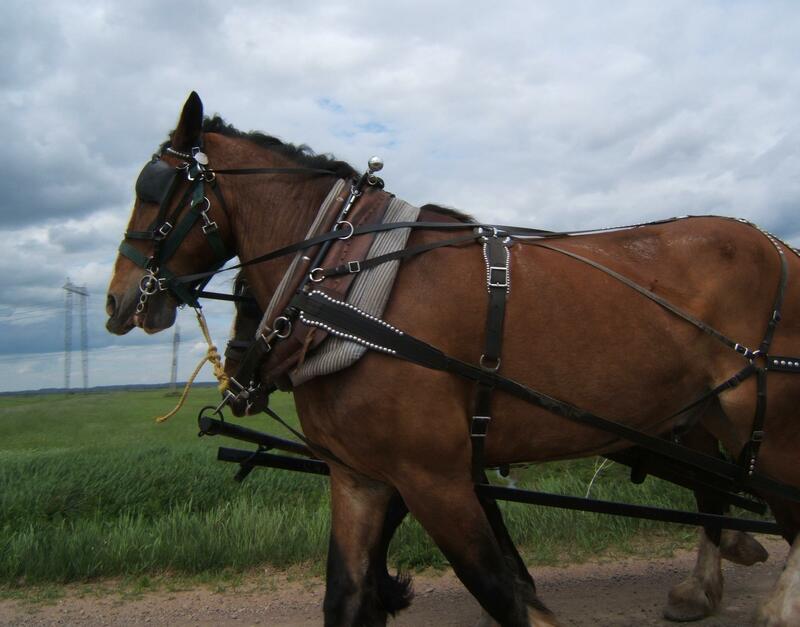 In June, while visiting the Tantramar River #2 (Wheaton Covered Bridge, built in 1916), we saw a team of horses pulling a sight-seeing group across the Tantramar marshes. 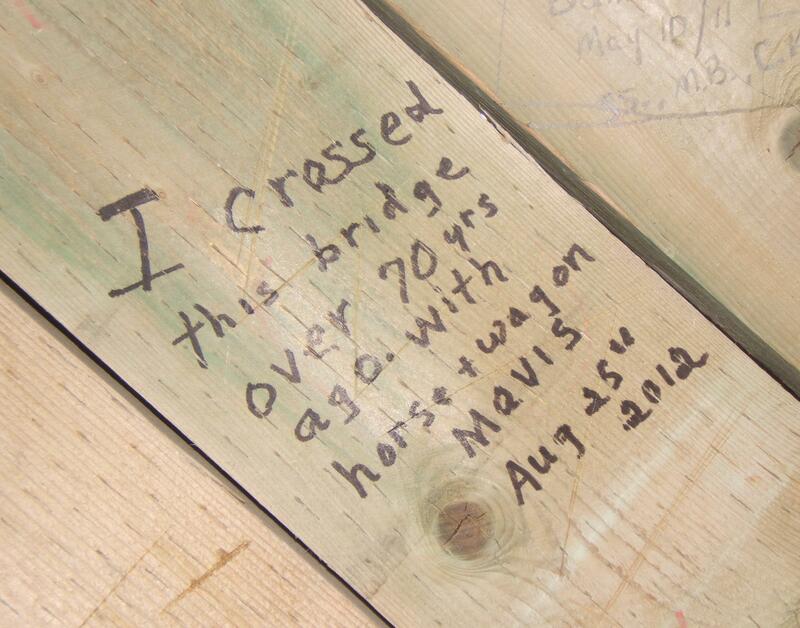 A notation in the Nackawic River #5 (Nackawic Siding Covered Bridge, built in 1927) mentions the use of the horse-drawn wagon. And last weekend, in the covered bridge over the Quisibis River (Quisibis River #2, Pont Lavoie, built in 1951), we found a painting of a horse. 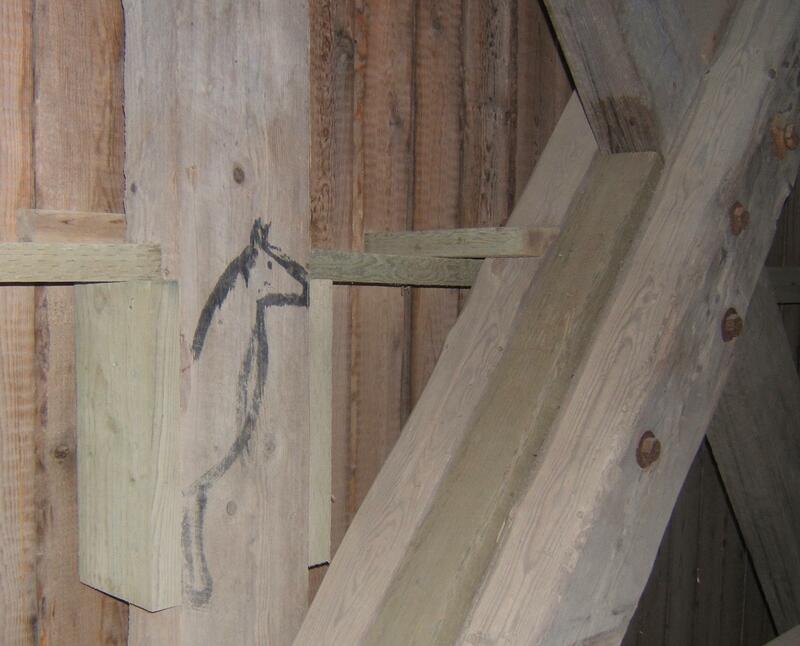 Whoever painted the horse resisted the urge to make any other black marks on the bridge walls. Clearly, he or she had a single intent – to depict the horse. 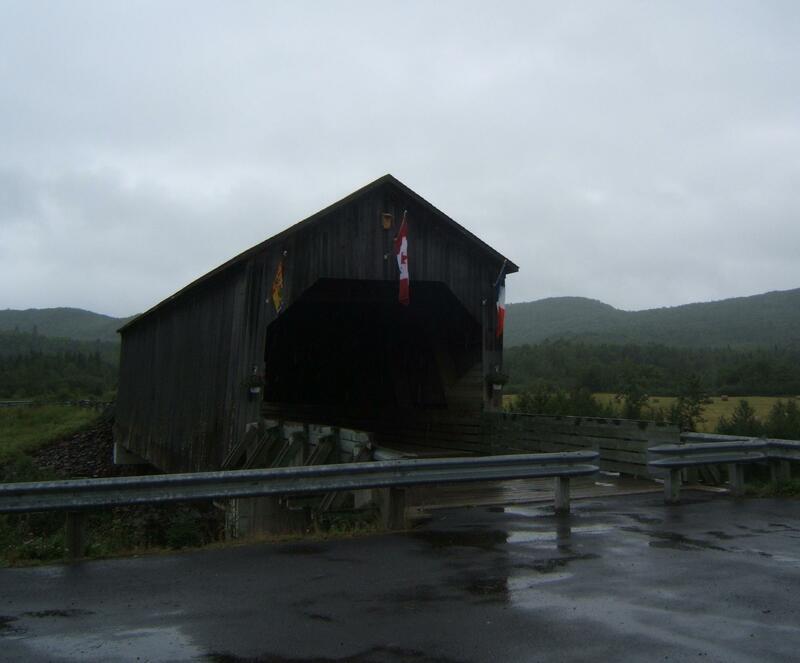 Of the 60 covered bridges in New Brunswick, most are in the southern part of the province. 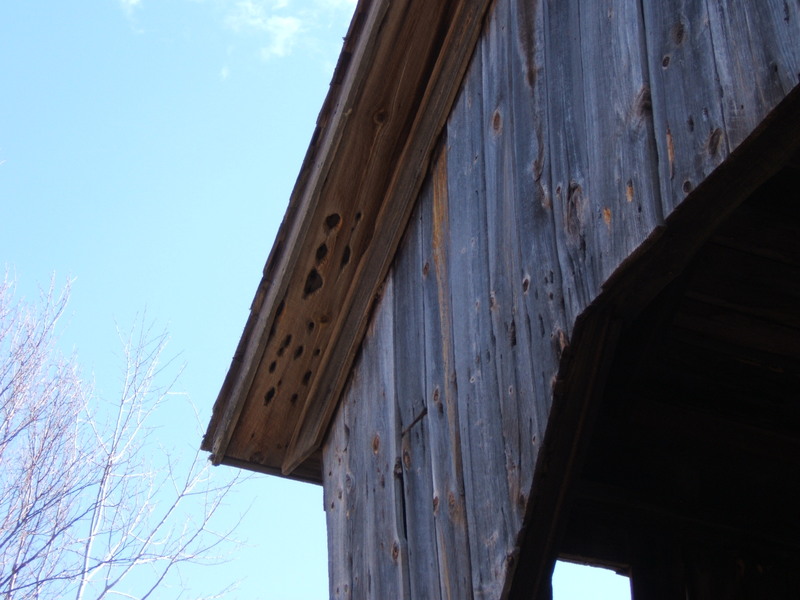 Last week we went to see the three remaining covered bridges in Madawaska County in the north-western part of the province. 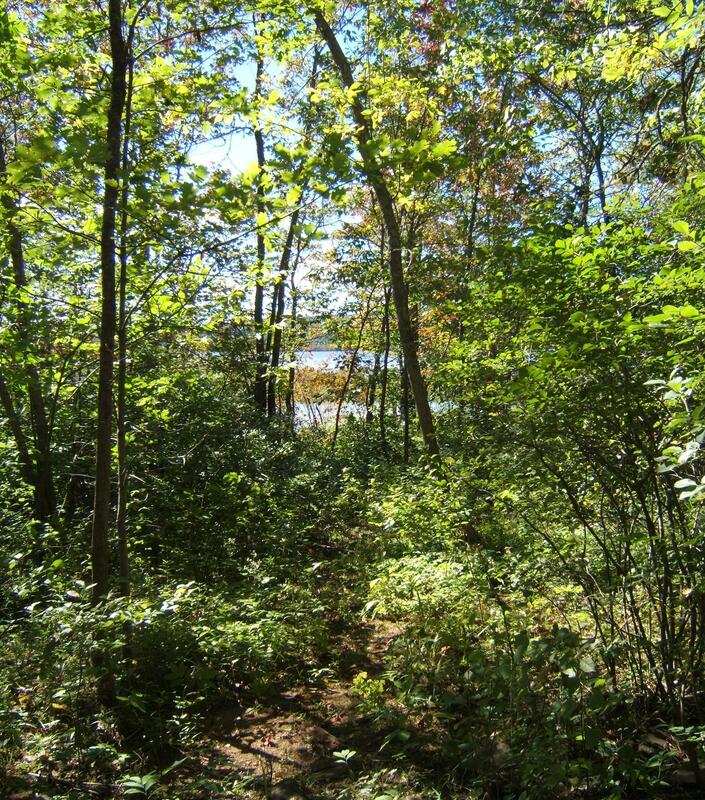 One of these was Baker Brook #2. 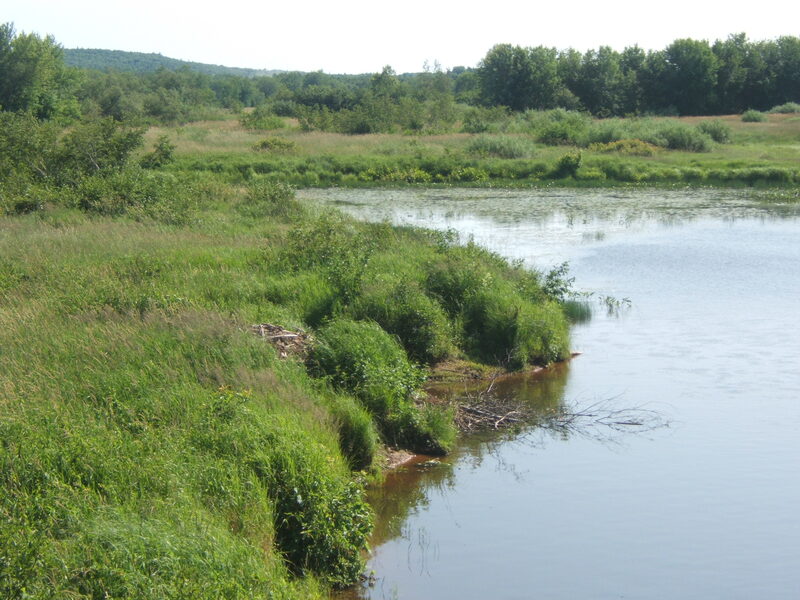 It crosses the Baker Brook west of Edmunston and is no longer in service. The bridge has been protected in a small park with a parking area. Bird boxes, flags and hanging flower baskets show there is local stewardship of the bridge. 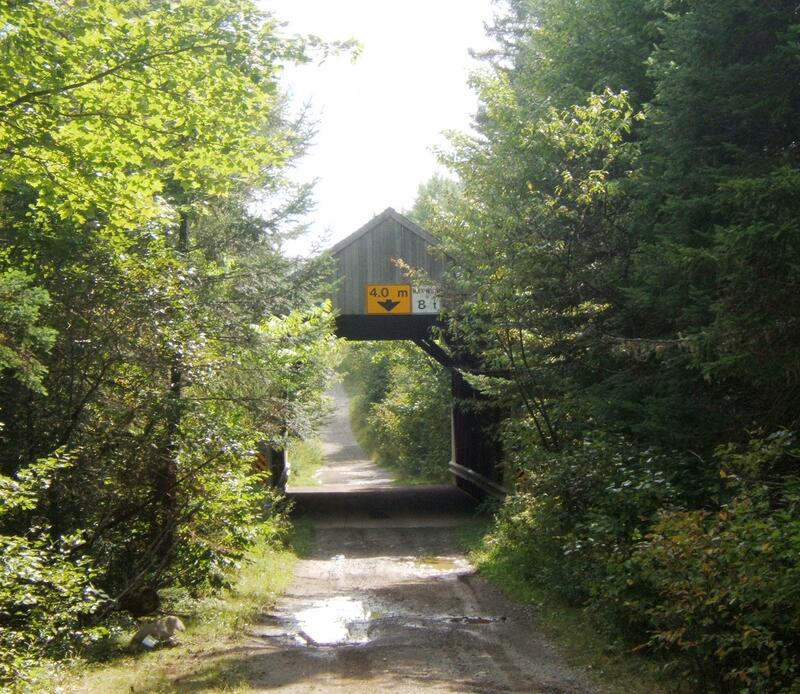 The Baker Brook #2 bridge was the essence of quiet. As we entered the bridge, the only sound was the patter of rain and the trickle of water under the bridge. The bridge is set against a backdrop of tranquil hills and fields. A deer watched us from a hayfield at the north end of the bridge. 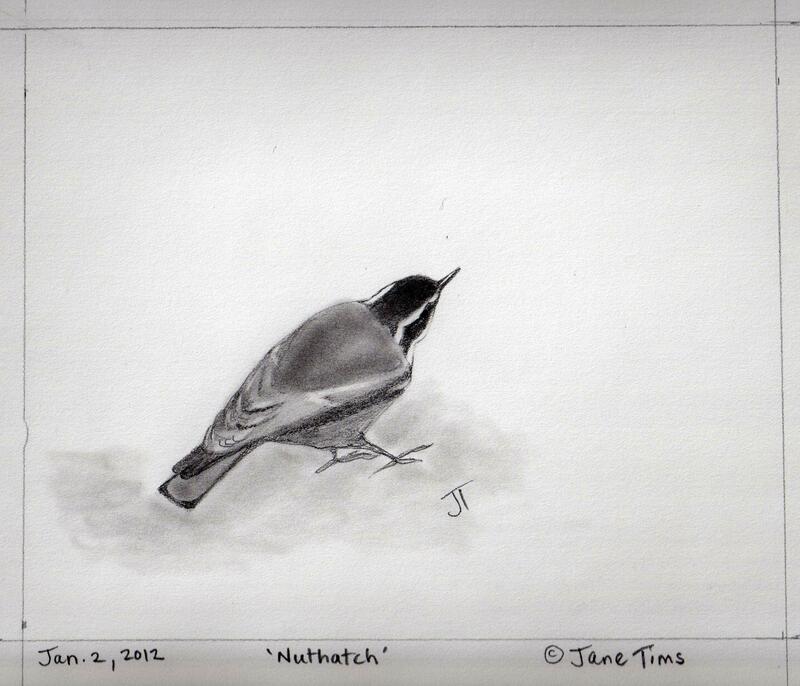 A white-throated sparrow called once and a crow made a few comments from the top of a round bale of hay. Otherwise, we were alone. I love the way the lichens have colonized the bridge and follow the boards, like rain, in lines down the outer walls. 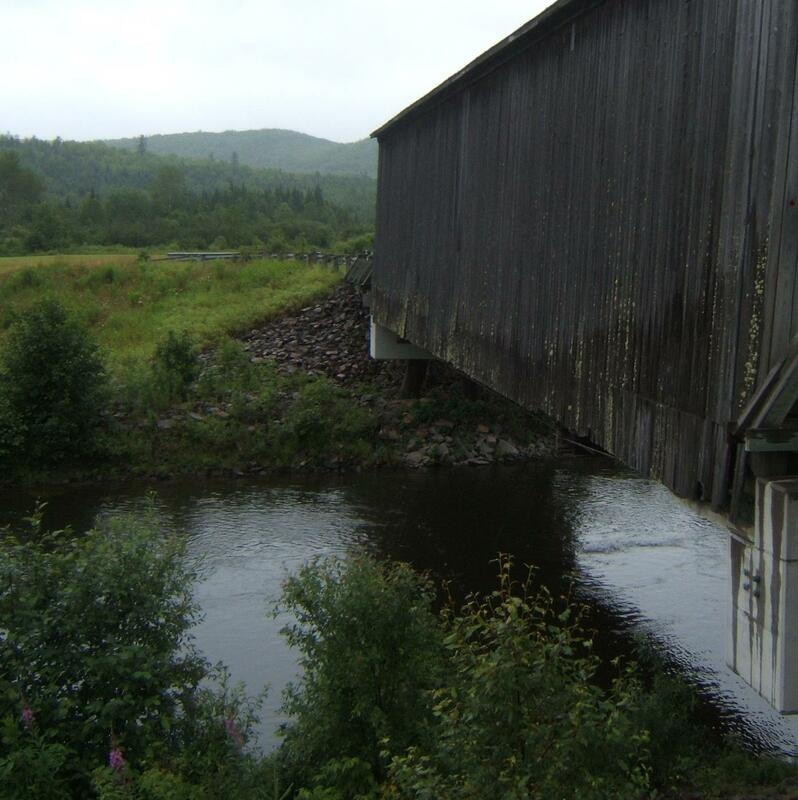 On a recent weekend tour of four covered bridges in southern Kings County in New Brunswick, we stopped at Bloomfield Creek. Built in 1917, this bridge is busy and well-used. It crosses a broad creek, very pond-like with its growth of lily pads (the yellow pond-lily Nuphar) and pickerel weed (Pontederia). 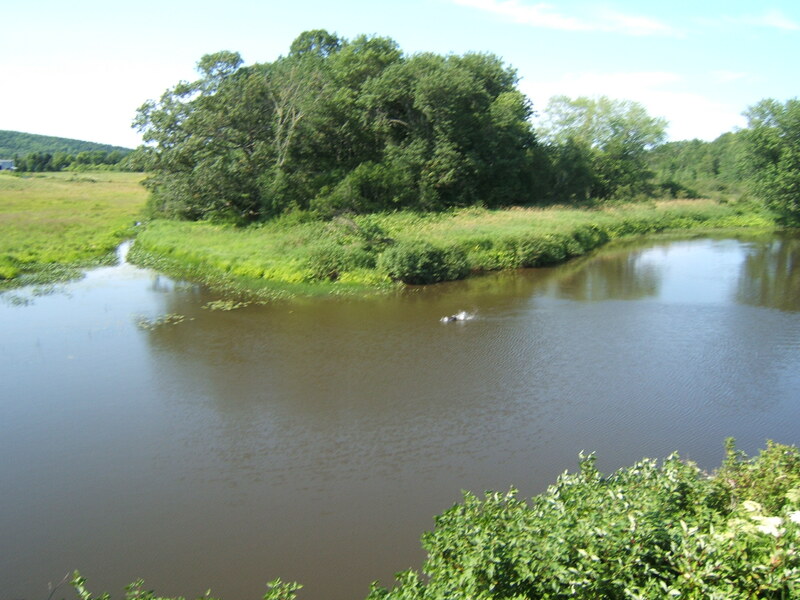 Along the grassy banks of the creek is a beaver lodge. 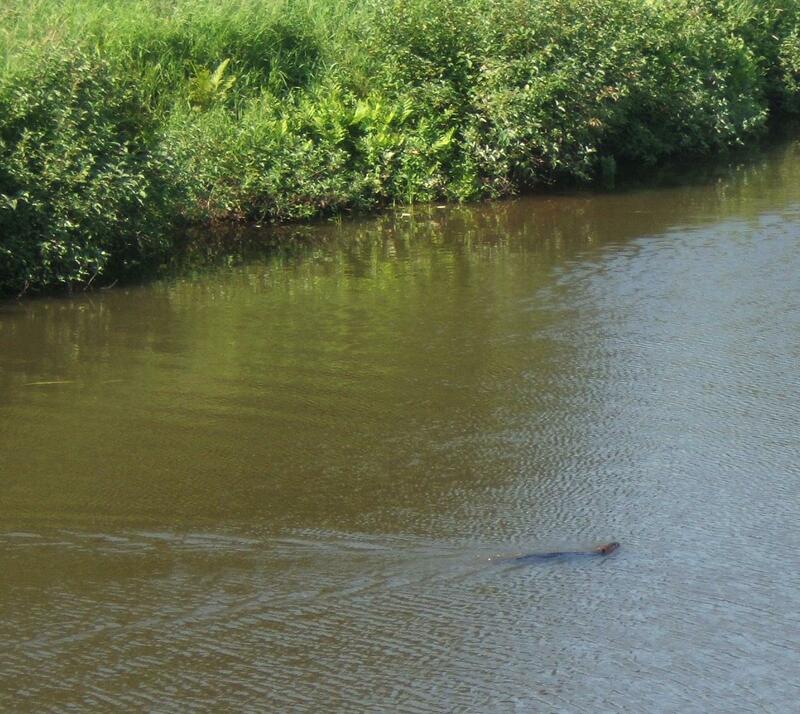 A large beaver kept us company while we visited the bridge. He swam back and forth along the river, in a course we were certain was designed to confuse and hide the location of his lodge. 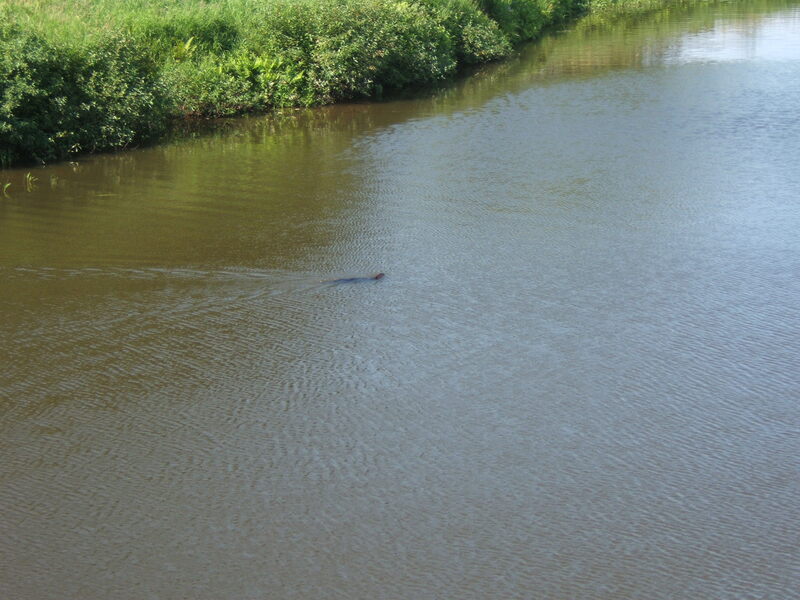 Most of the time he stayed on the surface – so soothing to watch his smooth brown body ‘towing’ a ‘V’ across the water. Every few minutes he would pause in his swim, arch his body, scissor his tail and lift it perpendicular to the water surface. Then he would slap the water and produce a loud ‘k-thud’ before he dove beneath the surface. In a minute or so, he would reappear to swim as calmly as before. I am so pleased to announce – I have recieved a grant in the field of literary arts (B Category) from artsnb – the New Brunswick Arts Board. 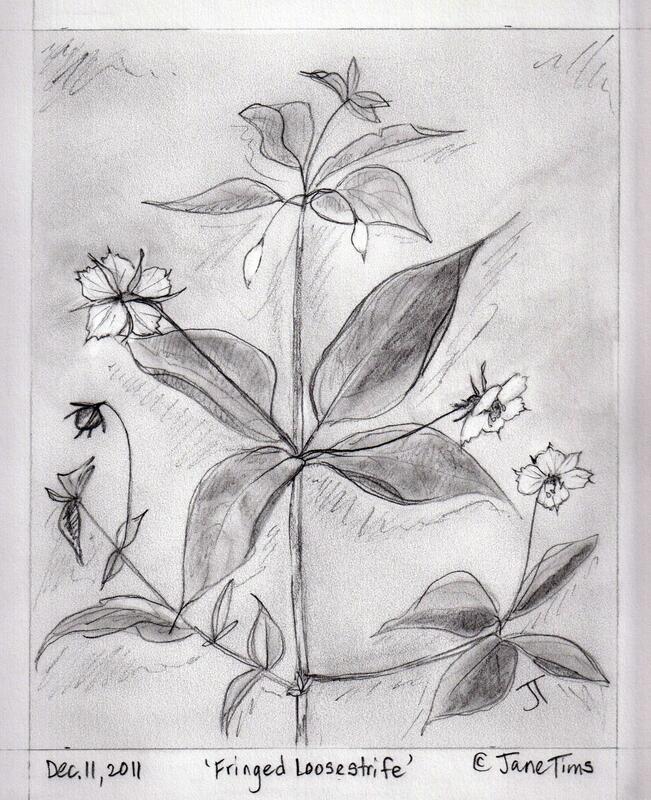 The Board has supported my work before, for my poetry manuscripts about ‘growing and gathering local foods’ and ‘harvesting colour’. 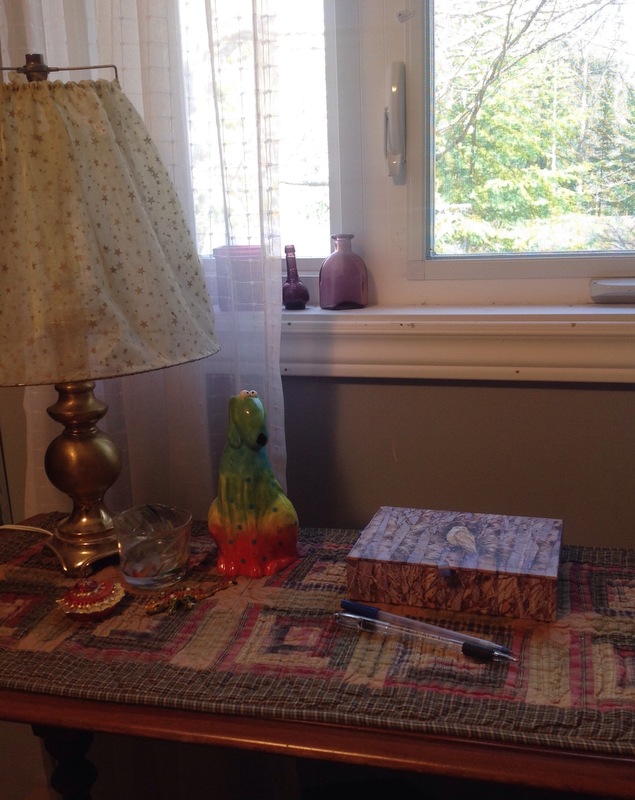 This new project will be to write a manuscript of poems about plants and animals growing in, around and under covered bridges. 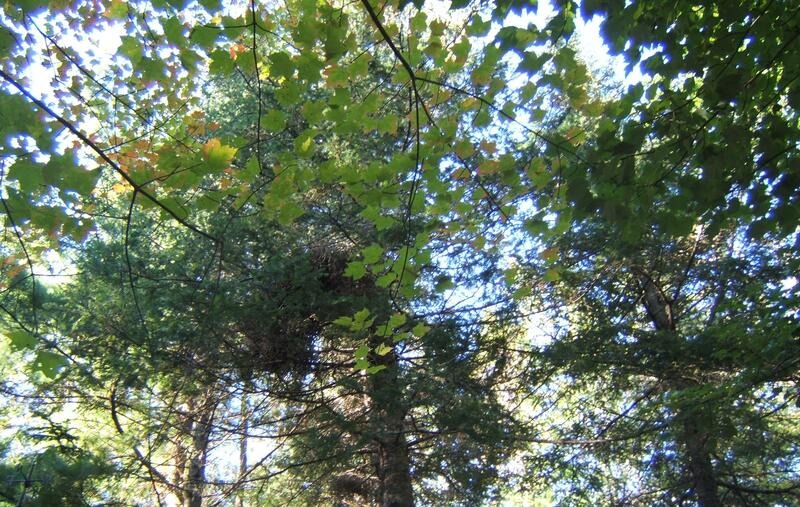 ‘In the shelter of the covered bridge’ will explore the natural history of these covered bridges, looking at how covered bridges modify the landscape and create a special environment for plants and animals. Because of my interest in human history, I’ll include poetry about the people who make use of the spaces of the covered bridge. 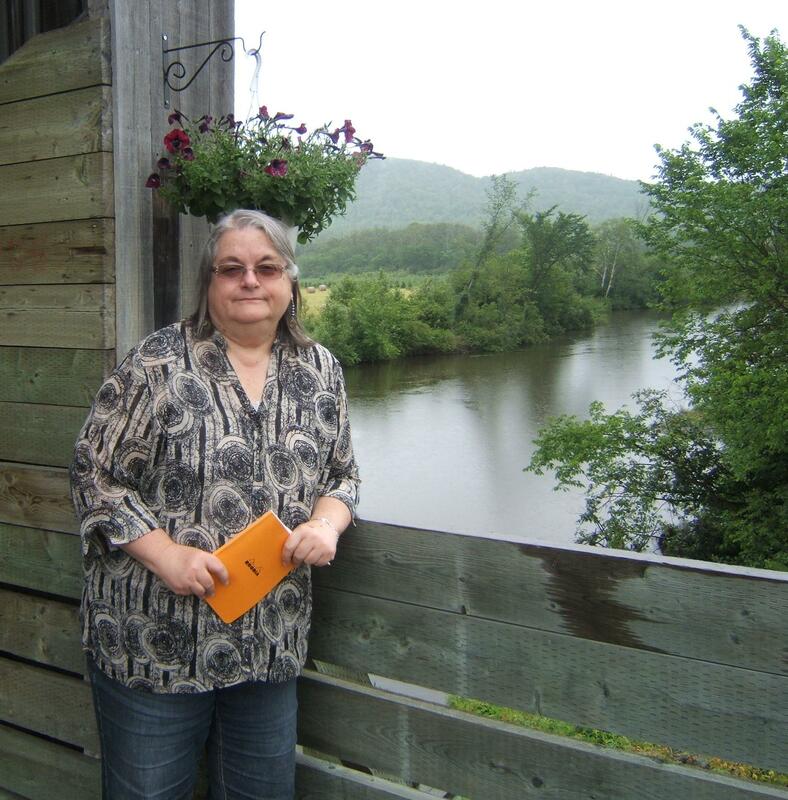 Since experience is so important to the writing of poetry, one part of my project will be to continue my travels to the covered bridges in the province, especially the 31 covered bridges in the St. John River watershed. Every visit will suggest new subject matter for me to explore with words. 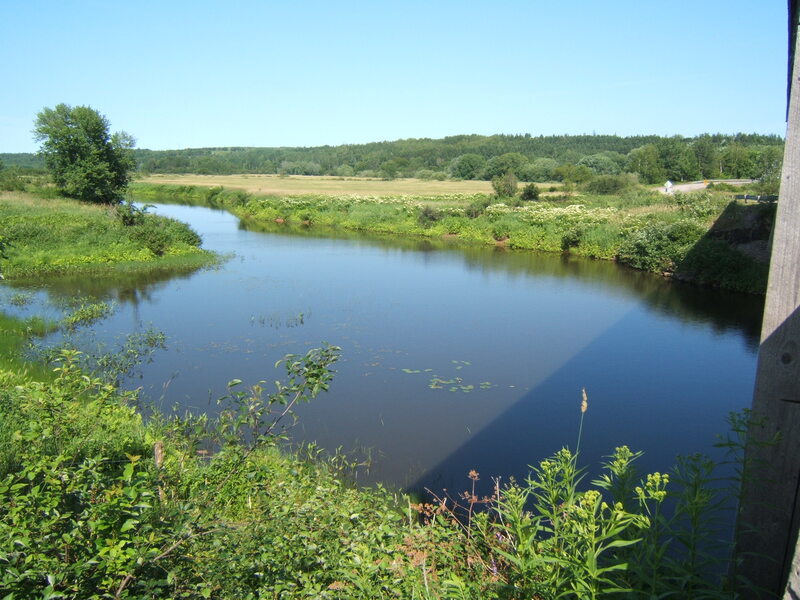 Of all the elements of this project, I think I will most enjoy the chance to show how important these bridges are to our natural and cultural history in New Brunswick.